Halfback Todd Gurley (#30) has been a vital cog in the Los Angeles Rams No. 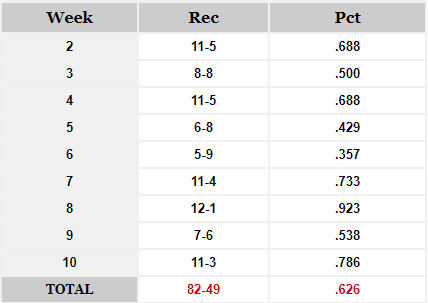 1 scoring offense and their steady ascent up the BES rankings. Our Week 10 BES Rankings mark the fourth week that the New Orleans Saints (7-2) have held the top spot. They first appeared there in our Week 7 report and have since extended their winning streak to seven games. More Tests Ahead for Saints – The Saints manhandled the Buffalo Bills (5-4) on the road with a defining 47-10 victory. Nonetheless, they’ll go on the road to face the Rams (7-2) in Week 12 before a divisional brawl at home against the Panthers (7-2) in Week 13. Furthermore, both teams come equipped with top-16 BES Defenses, something the Saints haven’t dealt with since escaping the Chicago Bears (3-6) in Week 8. Patriots, Steelers Again Top AFC Teams in the BES – The Pittsburgh Steelers (7-2) and New England Patriots (7-2) rank No. 5 and No. 6 respectively in this week’s report. Last year, the Patriots finished the 2016 season No. 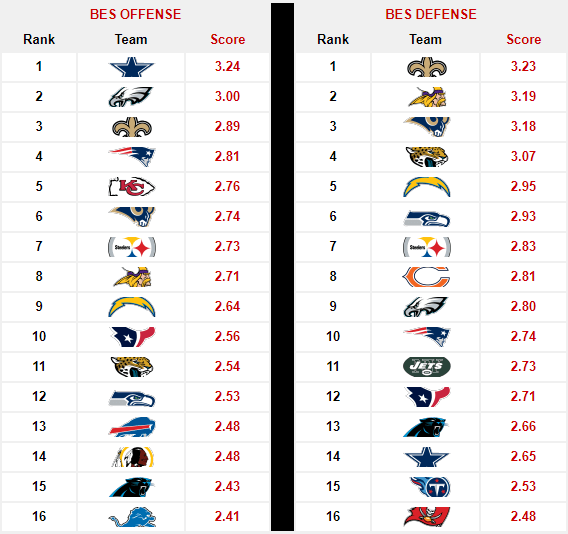 1 in our Week 17 BES rankings while the Steelers closed at No. 2. 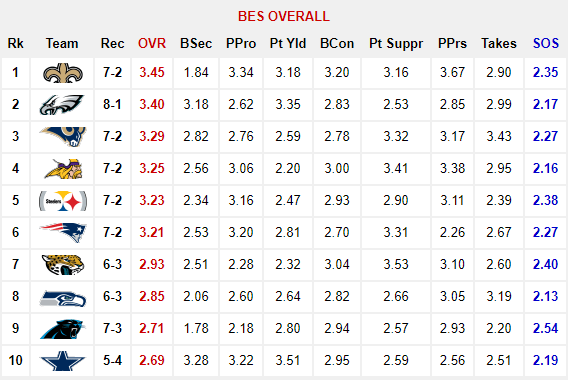 Currently, both teams own BES Offenses and Defenses in the top-10 and are gathering similar momentum towards their Week 15 rematch of last year’s AFC Championship. Panthers Bounce Chiefs From Top-10 – The Carolina Panthers (7-3) have maneuvered into the BES Top-10 after defeating the Miami Dolphins (4-5) 45-21 . 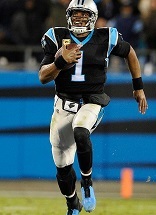 The win was the Panthers third in as many weeks thus their jump from No. 11 last week to No. 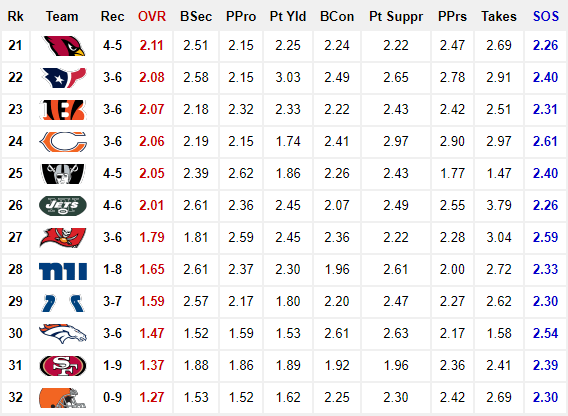 9 in our Week 10 BES Rankings. Consequently, they bounced the Kansas City Chiefs (6-3) from the top-10 entirely while bumping the Dallas Cowboys (5-4) down to No. 10. 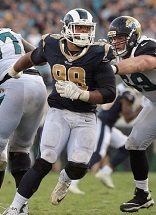 Los Angeles Rams (+.18) – The Rams (7-2) continue to rise, climbing from No. 5 last week to No. 3 in BES Overall. They’ve also gained +.25 points in BES Defense, going from 2.93 to a dominant 3.18. Atlanta Falcons (+.17) – The Falcons got a nice momentum boost after defeating the Cowboys in Week 10. They’ll need to sustain it for an upcoming four-game stretch that includes the Seahawks, Vikings and Saints. Houston Texans (-.11) – The Texans are 0-2 and in steep decline since losing quarterback Deshaun Watson (knee) for the season. Over that span their BES Overall score has taken a hit of -.35 points. Washington Redskins (-.18) – The Redskins have a respectable 4-5 record against the highest SOS (2.65) in our Week 10 BES Rankings. That makes them a dangerous draw, especially for the Saints in Week 11. Rams (No. 3) @ Vikings (No. 4): This is an absolutely beautiful matchup for those who love watching good defenses. However, though the two seem evenly matched, the Rams have a slight edge in momentum. Patriots (No. 6) @ Raiders (No. 25): If we had to pick an upset special for Week 11, this would be it. Raiders get the 2016 playoff matchup that eluded them last January due to the loss of quarterback Derek Carr to a late-season leg injury. Eagles (No. 2) @ Cowboys (No. 10): The loss of Ezekiel Elliot to a six-game suspension and some offensive line struggles for the Cowboys have sapped some excitement for this game. However, it’s still one of the better games of Week 11. Titans (No. 11) @ Steelers (No. 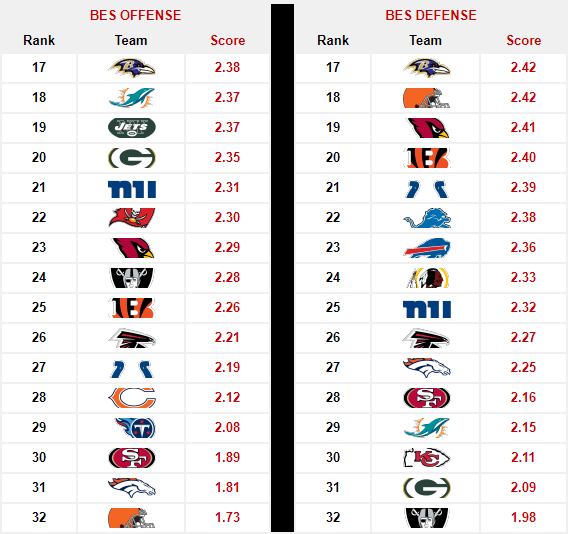 5): The Titans rank 29th in BES Offense and face an uphill battle in this one. Conversely, the Steelers have been sketchy against the AFC South with a 30-9 home loss to the Jaguars (6-3) and a narrow 20-17 win over the Colts (3-7). Love the website, and I enjoy reading your report every week. Keep it up. I especially enjoyed reading the best matchups of the week. 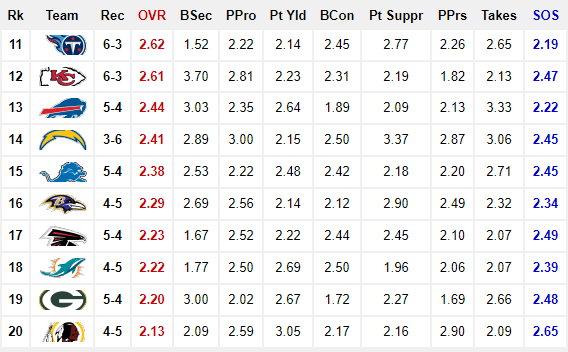 One request/suggestion: could you color code the values in the table (for example green/yellow/red backgrounds) to visually show how each team performs in each category? It would help to more quickly identify strengths and weaknesses when combing through the whole table. That’s a fantastic idea! Thank you so much! That’s the type of objective feedback I’ve been looking for. I’ll have to test it out. Could take a few weeks to to fully implement but it’s something that would definitely make the report more reader-friendly. That’s some good stuff! I like that name too… The Wade Factor… that’s pretty cool. I like his approach. I’m always open to new metrics. It’s amazing how many different ways there are to measure performance and they often meet at the same destination. 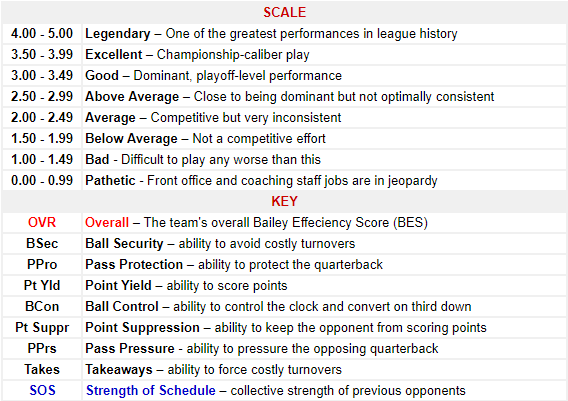 The BES and DVOA (Football Outsiders Metric), for example, tend to agree more often than not despite being two completely different approaches to measuring team performance.